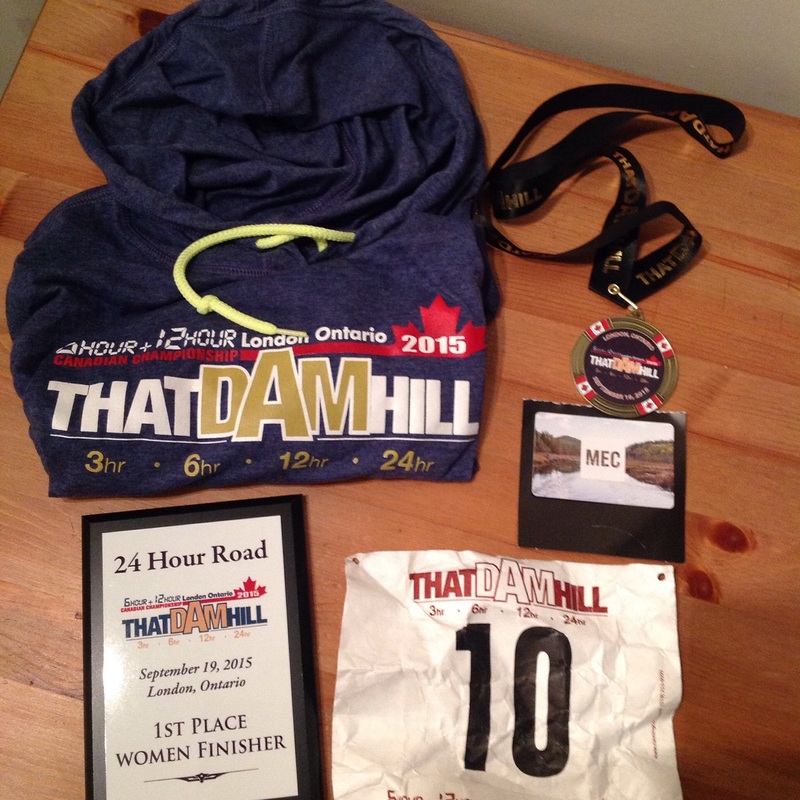 That Dam hill race takes place in Springbank park in London, ON. It’s a 2.24km loop that you run over and over. At the start of the race I ran a few laps with Nick. He was aiming for 100kms in the 12 hr event. It was nice to chat and get to know him a little in the early hours of the race. I felt good for the first 5 hrs, then my legs and feet felt dead. So I decided a walk break was in order. I walked 2 loops and then continued on running. And that was my pattern for the rest of the race. Run til my legs hurt too much, walk 2 laps, feel better, run a few more hours. Though the run to walk ratio got much smaller as the time went by. Sometime in the afternoon, I decided to check my phone and text Mel to tell her how I was doing and get an update on Diane. Sadly, I learned that she had passed away a few hours earlier. Mel said to keep on running ‘run for Diane’. I think I cried for the next two loops. Thanks to Clay Williams for running out to stop me and give me a hug around this time. The thing about this course is that when night falls, the skunks come out! The one section of this course was skunk central. Every time I went by I looked for their eyes being lit up by my head lamps. Skunks don’t bother me in the least except that I didn’t want to get sprayed by one. I gave them a wide berth every time I saw one. I got really tired around midnight. I almost stopped and lay down on the trail, but remembered that the stone cottage was warm and available to us. So I went in there, elevated my legs and feet on a chair and crashed on the floor. I think I stayed 10-15min then got up and kept going. I was at 132km at that point. Getting to 100miles seemed to take forever. It was tough going. Finally made it though! One more loop and I was closing my eyes, yawning a ton and hallucinating a bit. Time to crash again. This time I made the Decision to rest for much longer -40min went by I think before I was able to get up, get some warmer clothes on and head out for a few more loops. I was on my second walking loop when I saw Melanie arrive. She ran over and we chatted a bit. It was close to 7am and I decided I could probably slow jog the last hour. Until I caught up to a guy who was at about the same mileage as I was. Then with about 30min to go, I decided I wanted to try and beat him if I could even though I wasn’t completely sure what our total mileage was but I knew we were close. I think I heard some one say if I stayed ahead of him, I could finish in second place. So I POURED it on! I thought I could get in 2 more laps for sure. I didn’t look back once. But I did listen for his beep over the two timing mats along the river side to see how much of a gap I had. Much to my dismay as I passed the finish line, Mel yells ” you have time for one more loop plus a bit more!” I kinda didn’t want the bit more part. 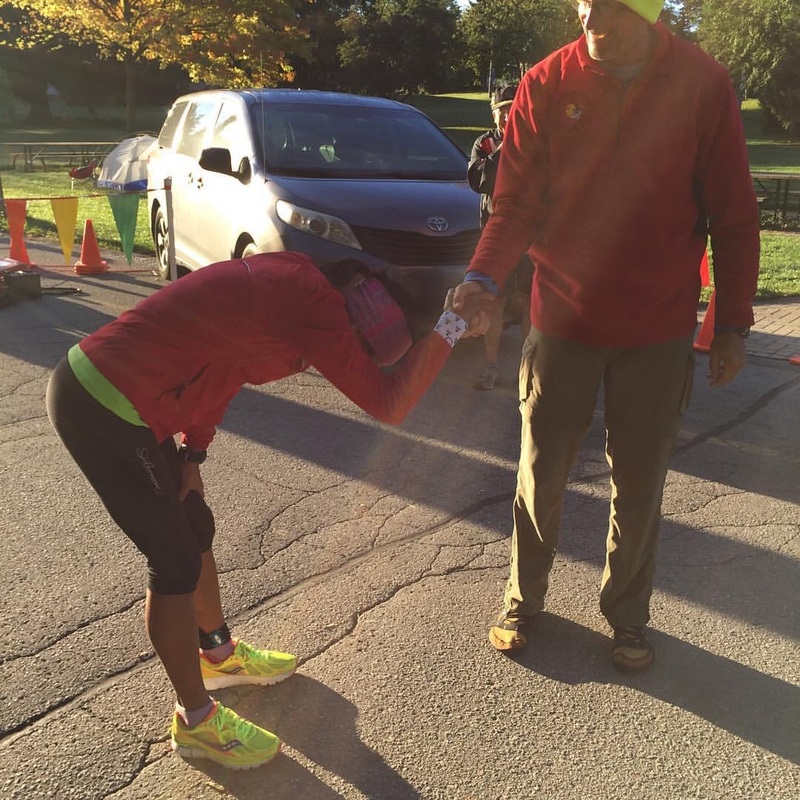 And turns out I had to finish one more whole lap so they could plot my final finish spot. And omg, was that last lap hard. I hadn’t planned on one more loop. My pace was slowing and the lactic acid was creeping up my legs coming up That dam Hill for the final time. My legs felt like cement blocks and the final sprint didn’t feel very sprint like. But I finished!!! My first 24hr race! It was tough. Especially the hours between 12-6am. 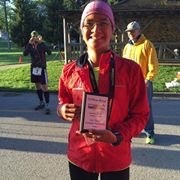 I’m happy I stuck it out and finished good enough for first female and 2nd overall. Surprisingly I never got bored running all my loops. I never listened to music either. I listened to the sounds of the ducks and geese near the river and that was entertainment enough. Thanks to Clay and Rhonda for crewing, Mary-Lou for the hug at the beginning, all the runners who gave words of encourage to during the race (Maryka, Jodi, Mary-Lou, Steven, Nick, and all those whose names I don’t know or can’t remember), Dave Carver for the entry, all the volunteers at the aid stations, MCMTiming, Melanie for coming to get me & driving me home.